“Life is a competition between you and yourself” – Mark Twain. 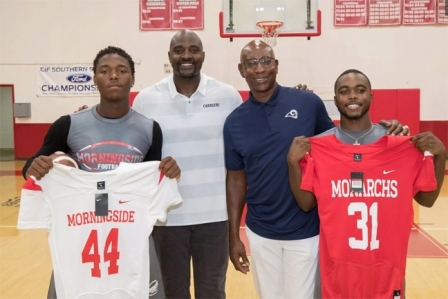 Former Los Angeles Chargers defensive end Marcellus Wiley recited that quote in front of the Inglewood and Morningside High School varsity football players as he and Rams’ Hall of Fame running back Eric Dickerson unveiled the new football uniforms donated by the respective teams on Tuesday (Aug. 7). 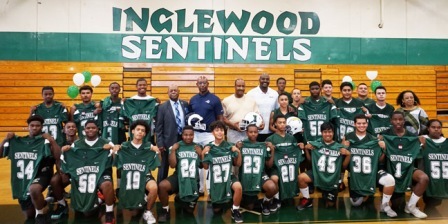 The Rams and the Chargers teamed up to donate $10,000 each towards 50 home and 50 away jerseys for both Inglewood and Morningside High School. As the high school players entered the gyms, echoes of jersey numbers were being called out. Smiles filled the gym as players closely examined their new jerseys. The players were equally surprised by Wiley and Dickerson’s involvement in the special unveiling. Though the day was about the two NFL franchises giving back to their community, Wiley shared that it was a special moment for him to share the stage with Dickerson. Wiley, a South Central Los Angeles native, recounted playing pop warner football as an adolescent in Inglewood. He went on to graduate from Ivy League Columbia University. He emphasized to the players the importance of staying focused on education and setting goals both on and off the field. The players were not the only ones who were excited about being gifted with the new uniforms. When Inglewood head coach, Michael Grimble, found out that the Chargers and Rams were donating the jerseys he was overcome with emotion. The Rams and Chargers will not only share this joint effort, soon the two organizations will call the LA Stadium and Entertainment District at Hollywood Park in 2020 their home stadium.